Galentine’s Day Happy Hour! Grab your girlfriends and join us for our inaugural Galentine’s Day event in honor of female friendship. “Oh, it’s only the the best day of the year!” according to Leslie Knope. 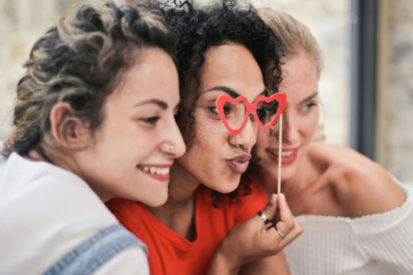 Leave your husbands and boyfriends at home (if you have one) and celebrate your lady friends—that’s what Galentine’s Day is all about! You’ll be welcomed with a taste of bubbly to “cheers” to your gal pals, then enjoy a delicious happy hour buffet of heavy hors d’oeuvres. The ticket price also includes a glass of wine. Don some fun props and commemorate the evening with pics in front of our photo wall! The Galentine’s Day Happy Hour is from 5:30-8:30 pm. 10% discount on all additional wine purchases. Guests may also call the Tasting Room on 571-439-2255 to pay by phone and save the Eventbrite fees. 21+ only. Dress is casual.